Read Stride Right Around Back Pain by Dr. Barry Coniglio to learn more about Coniglio Chiropractic Wellness Center and our Chiropractic office in Mantua, NJ. Grab your sneakers and a light sweatshirt and let’s get walking! While some fitness enthusiasts relentlessly seek out the latest, trendiest exercise crazes, many others are returning to good, old-fashioned walking to help them feel great and get into shape without becoming a member of an expensive gym. Best of all except for a good pair of walking shoes, it requires virtually no equipment. So whether enjoying the wonder of nature or simply the company of a friend, walking can be a healthy, invigorating experience. And thanks to its convenience and simplicity, walking just might be right for you, too. A sedentary lifestyle has a debilitating influence on people’s health as they age. Therefore exercise is imperative. When trying on shoes, be sure to wear them for at least 10 minutes at the store. Once you have purchased a pair of shoes, don’t walk them on the ground. While estimates vary as to when is the best time to replace old shoes, most experts agree that between 300 and 500 miles is optimal. Put Your Feet On The Floor! Don’t stoop your head or look down at a phone or the ground as you walk. This position of the head will challenge the normal forward curve of your neck, which, in turn, will cause you to carry your weight improperly. Walk briskly, with “purpose.” Simply sauntering, while relaxing and enjoyable, is not an effective form of cardiovascular exercise. Of course, be sure to consult your doctor before beginning any exercise program. 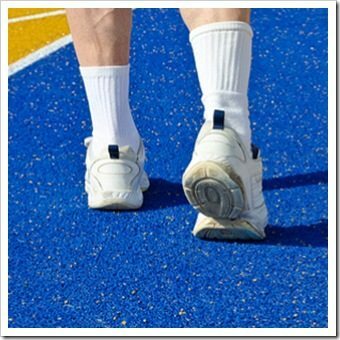 Walking on a cushioned or rubberized track is ideal because the cushioning of this type of track absorbs most of the impact of your walking. Many recreation centers offer this type of track free of charge. The grass is another good surface, but watch out for hidden dips or holes in the ground. Walking on a surface with no give, such as concrete or a mall floor, is not your best choice because this type of surface will not absorb much of the impact your body will experience. If you do choose to walk on such a surface, be extra careful to select highly cushioned shoes. We want to help keep you moving in perfect balance to maximize the benefit and help to avoid low back, hip, or knee pain. So as you lace up and head for the open road make sure to call and get a check up for top performance. This entry was posted on Thursday, October 20th, 2016 at 4:12 am and is filed under Health Articles. You can follow any responses to this entry through the RSS 2.0	feed. You can skip to the end and leave a response. Pinging is currently not allowed.